Texas A&M International University (TAMIU) will host the 5th International Mariachi Festival, welcoming high school mariachi groups from across Texas to its campus Thursday-Friday, April 25-26 for an exciting learning experience with Mexico’s legendary Mariachi Nuevo Tecalitlán. On Saturday, April 27 at 7 p.m. in TAMIU’s Center for the Fine and Performing Arts Recital Hall, Mariachi Nuevo Tecalitlán returns to Laredo in concert to delight audiences of all ages. Tickets for the “Serenata Mexicana” Concert are $45 and $50 and can be purchased at TAMIU’s Bursar’s Office, located in the Senator Judith Zaffirini Student Success Center or by calling 956.326.2273. Tickets may also be purchased at the door. Doors open at 6:30 p.m.
Dr. Minita Ramírez, TAMIU vice president of Student Success, said concert proceeds benefit TAMIU mariachi student scholarships. The Concert culminates TAMIU’s 5th annual International Mariachi Festival. “Our hope is that students who attend our festival and concert will learn more about the rich culture and traditions of Mexico’s music and get to experience college life, love it and return as students,” Ramírez said. The Festival, designed for high school student mariachi groups, will welcome over 500 students from more than 20 Texas high schools. The International Festival features two days of mariachi workshops provided by the University’s first-ever artists in residence, Mariachi Nuevo Tecalitlán; a performance competition; and Saturday’s concert. Also participating are Lehman High School (Kyle), Martin High School (Laredo), Nixon High School (Laredo), Premont Collegiate High School (Premont), San Marcos High School (San Marcos), Sharyland High School (Mission), Sharyland Pioneer High School (Mission), Southwest High School (San Antonio) Southwest Legacy High School (Von Ormy), United High School (Laredo), United South High School (Laredo) and Zapata High School (Zapata). This year, TAMIU has partnered with United Independent School District and United South High School for the high school mariachi competition. The competition with take place Saturday, April 27 at the UISD Student Activity Center (SAC). Doors will open at 7:30 a.m. for the competition. Entry fee to see the competition is $5, Ramírez said. 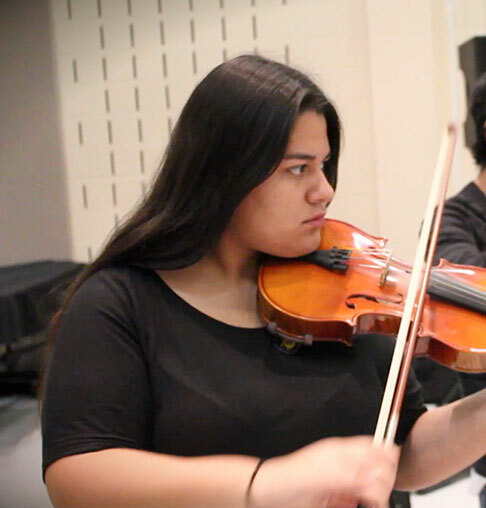 “The winners of the competition will open Mariachi Nuevo Tecalitlán ‘Serenata Mexicana’ Concert, as will the TAMIU Mariachi Internacional on Saturday, April 27,” she said. Mariachi Nuevo Tecalitlán was founded in 1965 by brothers Fernando Martínez Barajas and Pepe Martínez Barajas, and toured Europe, Latin America and the U.S. A second generation of musicians joined the 12-piece traditional Mexican group during the 1980s and 1990s --Fernando Martínez, Jr., Angel Martinez and Alejandro Martínez among them. In 1997, Fernando Martínez Arregun and Angel Martínez Arreguín, sons of Don Fernando, became Tecalitlán’s Musical Director and General Manager. More of the University’s story is available on its website, tamiu.edu and dedicated social media channels on Facebook, Instagram, LinkedIn, Twitter and YouTube.